17-year-old Sophie Godwin is a working pupil. She is an active member of West Midlands Pony Club, gaining her full Pony Club B test in 2016 and her Equine Management Level 3 in 2017. She has evented to BE100 on her 14.2 connemara pony Sam, winning Area 7 PC90 Hunter Trials in 2015 and finishing 10th at the PC Championships at Cholmondley Castle. She now has Sam’s 5-year-old brother Ross, who she purchased as an unbroken 3-year-old from Rosscon Stud in Ireland. 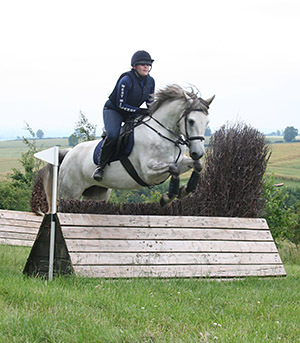 She has backed him herself and started his eventing career in 2016. Sophie’s aim is to progress to BE100 with Ross by the end of the 2018 season, and train towards her UKCC.